The tree branches are bare, the temperatures have dropped, and the first snow has fallen: By the end of the month, winter will officially be here. With the weather less than favorable, more likely than not you and the kids are spending more time inside each day. 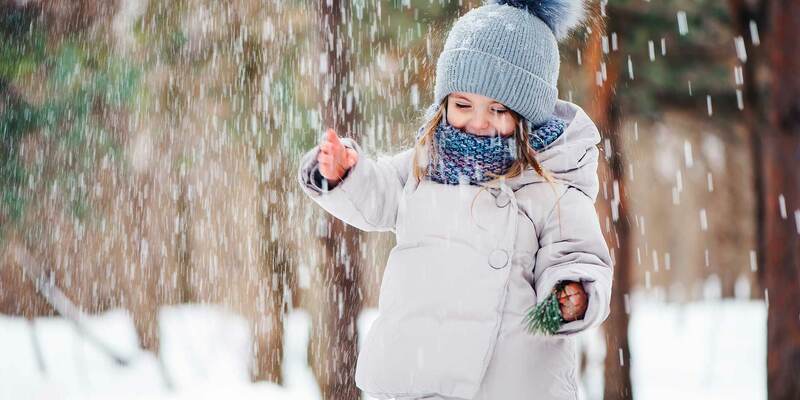 However, outdoor play in the winter is still important to children’s mental and physical health. Here are four reasons to bundle up and enjoy the snowy weather. Exercise. Health experts recommend 60 minutes of moderate to intense activity per day for kids, and there often isn’t enough space for this to happen inside. Not only will the outdoors give them plenty of room, but the more challenging winter landscape encourages the use of bigger muscles to plow through snow or climb a hill to sled. An added bonus while they get this exercise outside: Vitamin D. This is especially important for raising serotonin levels, which can drop in the winter months with the darker landscape and result in Seasonal Affective Disorder. Critical thinking. What’s the fastest way to slide down that hill without a sled? How can you run across this snow without slipping? What’s the best plan to build a snow fort, pack a snowball, or roll up a snowman? It’s entirely new terrain for kids to explore that will stimulate their creativity and problem-solving skills. Nature lessons. The snow provides a great opportunity to look at the environment from a different perspective. Kids can watch how the weight of snow lowers strong tree branches, view different animals that might not be out in the summer, and compare different animal tracks and boot footprints. You can even bring out some black construction paper to use as a background for examining individual snowflakes, or mix food coloring and water in a squeeze bottle to draw on the snow and then see how the colors mix and change in the conditions. Sickness prevention. Playing outside can actually boost kids’ immune systems. Inside, bacteria and viruses are rotated within and between each room in warm, poorly ventilated air, making it easy for germs to spread from person to person. Of course there are germs outside too, but that more organic exposure is natural and can help children become less likely to develop autoimmune diseases and allergies later on. So what’re you waiting for? Layer the kids up, don’t forget the hats and mittens, and enjoy your wonderland exploring. We have been loyal Procare customers and that will never change. Combining all of the features that Procare has to offer makes my job and my staff's jobs so much easier and stress free.